What is matcha? 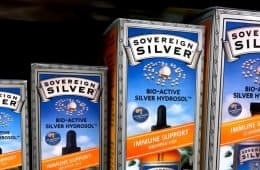 Probably not what you’ve been drinking! Imposters are everywhere. That unhealthy Starbucks latte is not what the Zen monks were drinking. 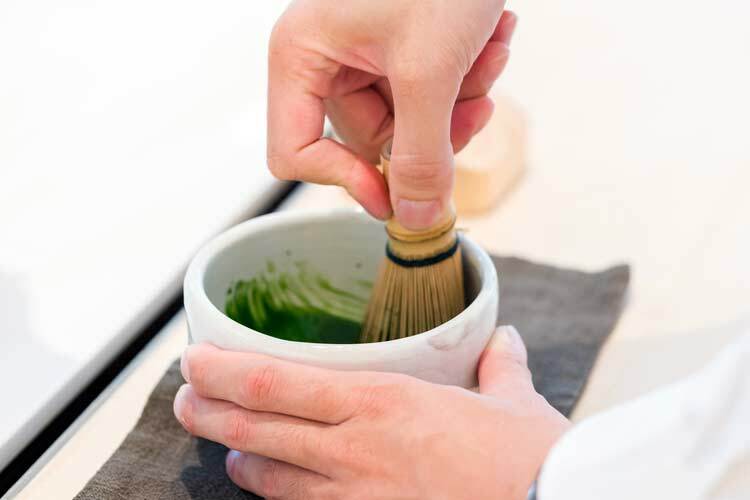 Using instructions straight from the horse’s mouth – a Japanese tea specialist – here’s the right way of preparing the popular drink. 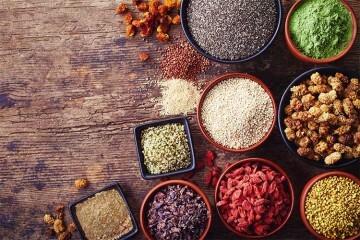 This historical recipe is just as good for you today as it was hundreds of years ago. You will need the real powder (more on that below), as well as the traditional tool set which includes a sifter, bamboo whisk, and tea bowl. With those in hand, you are now ready to experience what it really tastes like. 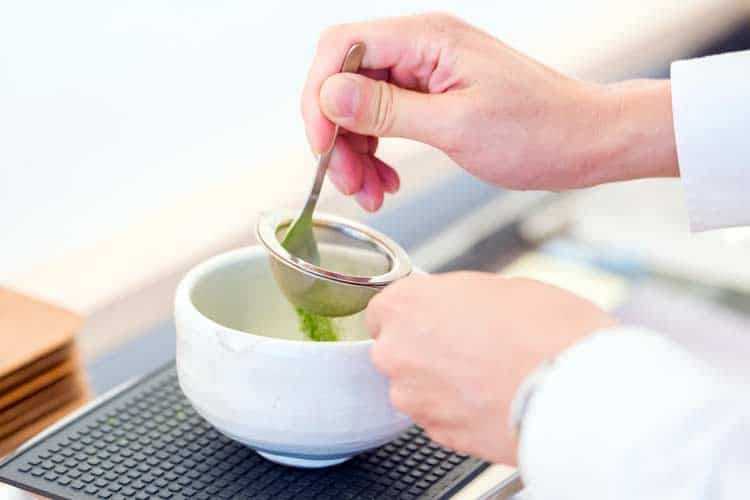 Unlike green tea which you steep in a bag or ball, the process of preparing matcha requires a bit more legwork. Don’t be scared though, as it’s still something you can pull off in 5 minutes. In fact, once you get the hang of it, you will probably beat the time it takes for your coffee machine to brew a pot. 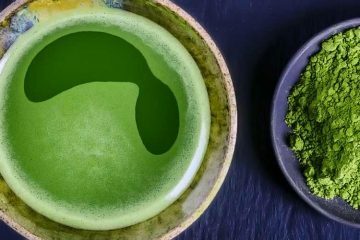 You won’t even need electrical equipment like that either, as this is the oldest (and healthiest) matcha green tea recipe. Traditionally, the standard serving size is 1.8 grams of matcha powder per cup of tea. That’s the weight of how much fits on a chashaku, which is the curved portion of a bamboo utensil that the Japanese have used for centuries to scoop the powder from the natsume (tea caddy). 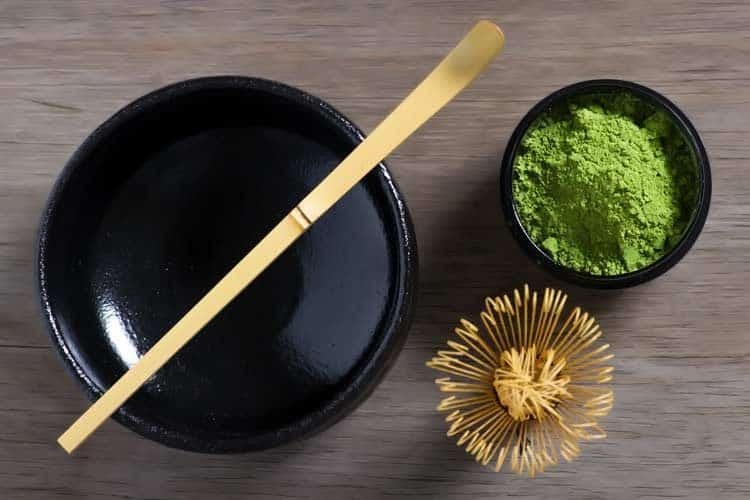 In modern times, there are specially sized matcha spoons which can be used in lieu of the original wooden chashaku. No chashaku or special spoon available? No worries! One heaping teaspoon is the equivalent of 1.8 grams of un-sifted powder (but heap it as high as you can to get there). 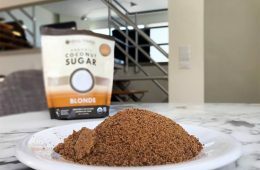 If you are measuring using powder which has just been freshly sifted, it will be even more, as the extra tends to not fit on a teaspoon’s “mountain” of powder. Either way, there’s no need to hassle with a scale. Simply use one heaping teaspoon, which will clock in at somewhere between 1.5 and 2 grams. While this step is not absolutely required, traditionally the powder is sifted in a strainer as it falls into the bowl below. With the lower grades of matcha you don’t have to do this. However with the best grade – ceremonial – it tends to clump together, which is why sifting is done. Scoop the powder into the sifter and using the spoon, sift it through the mesh. Water boils at 212 degrees Fahrenheit, but that high of heat will destroy some nutrients. 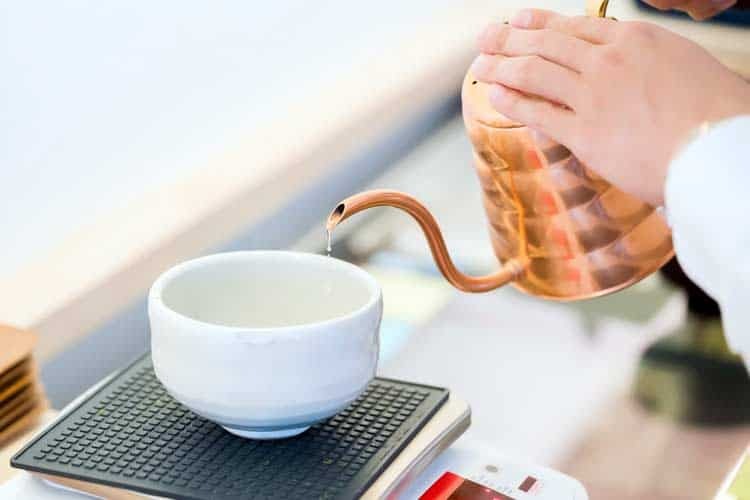 The ideal water temperature for matcha tea will be warm but not boiling hot – around 175°F (79°C). Staying at or slightly below that temperature is the best way to maximize the antioxidant content. Using a thermometer over complicates things. The easiest method is to boil your water and then allow for it to cool 5 minutes before adding. Traditionally, how much water to make matcha with is only 2 fluid ounces. That’s the equivalent of 1/4 cup. However being that our generation is accustomed to big beverages, most people use a 1/2 to 1 full cup of water (4 to 8 fluid ounces). 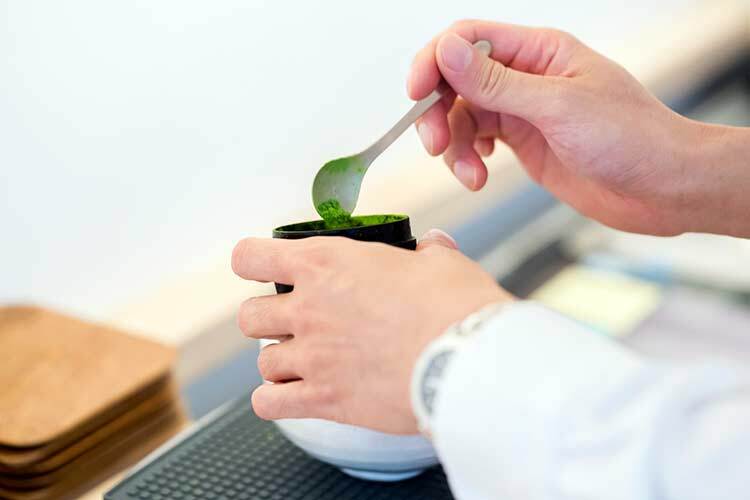 If you want to hold true to the original Japanese tradition, the ratio of how much water to use per cup of matcha will be only be 2 ounces. This is why the deep tea bowl (called a chawan) is used instead of a cup for making this. Whisk the tea with the chasen until frothy, moving the brush in a zig-zag motion. 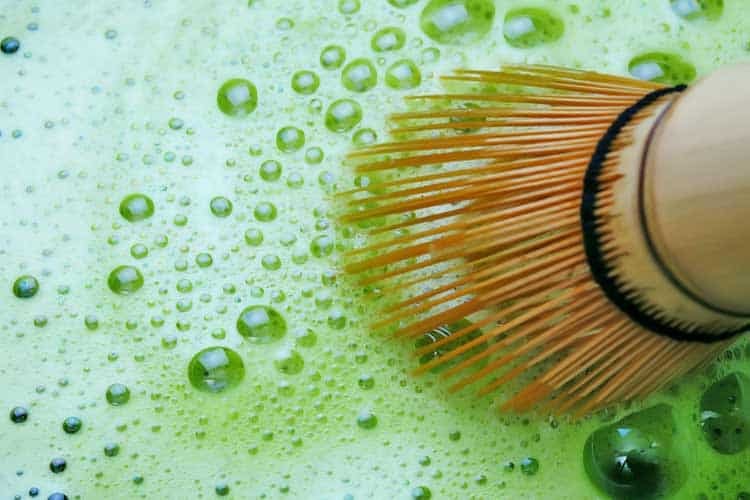 How long to whisk matcha ranges from 30 to 60 seconds, as that’s the typical time it will takes to attain the signature velvet foam. Not all grades will produce a high amount. 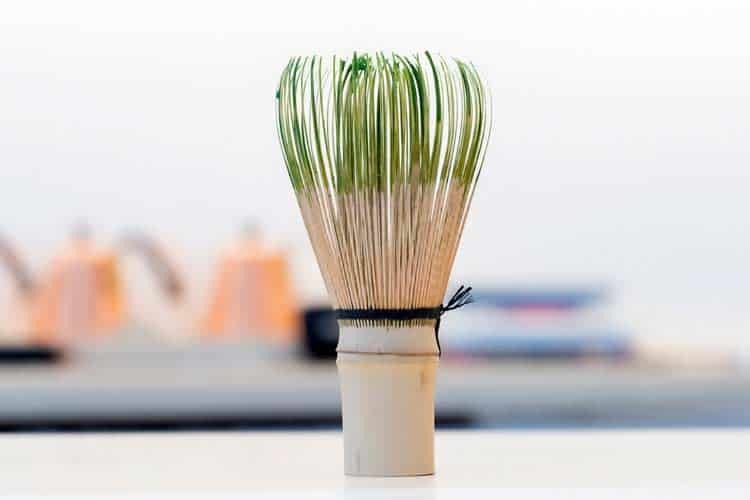 Some people have asked how to prepare matcha without a whisk. 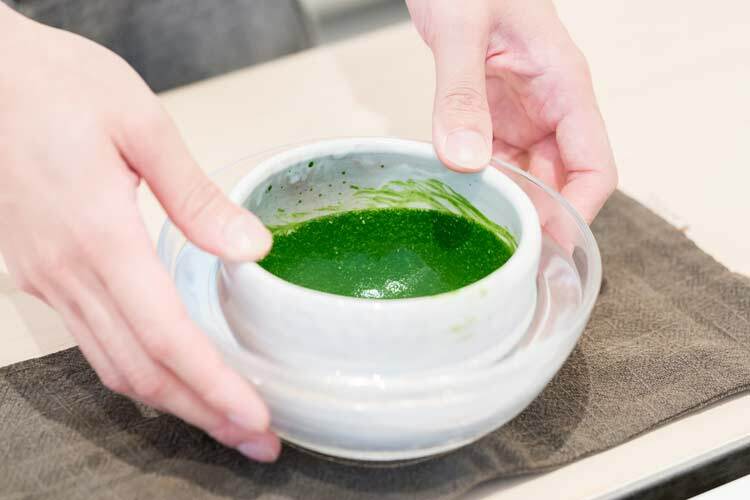 Stirring the powder with a fork won’t work, as the matcha doesn’t foam (even though the fork will dissolve it). Unless you find a way to aerate it, you will have no foam. You can churn the tea in a blender for several seconds (try a Magic Bullet or Nutribullet). You can shake the liquid inside of a closed container (try Tupperware or an empty glass bottle with cap). Rather than shake it up and down, try to move the container in a circular sideways motion, as that will help to keep the foaming action on the top. Either method will result in the creation of at least some of that smooth frothy foam, which is an essential component of this drink. Though to be clear, forgoing the whisk will not truly mimic the texture of the original Japanese recipe. The froth is also why you will want to serve it within minutes after preparing. Just like with a coffee latte, if you were to let it sit for an extended period of time, the foam will disappear. There’s nothing wrong with refrigerating it and enjoying a cold matcha drink later on, but just be aware that making it cold or iced will produce a flat texture. When prepared using the the original 1.8 grams of powder, you will be getting a buzz of 43 mg of caffeine (1). 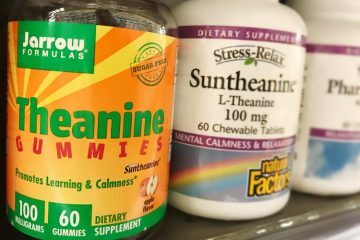 Unlike coffee, the soothing L theanine content in this tea is believed to help offset some of the typical jitters which come with other caffeinated drinks. For most people, a high quality ceremony grade like this is too expensive as a daily indulgence. While the actual bubbles will dissipate quickly, the drink will retain it’s foamy texture as you slowly savor this Japanese delicacy! Most tell you about the antioxidants it does have, but let’s talk about what it does not have. Almost no calories or carbs! 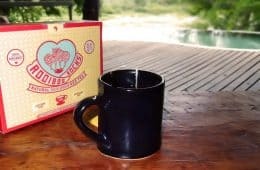 This tea is healthy for you if you’re watching your weight. If you have cardiovascular problems like high blood pressure, maybe not so much. 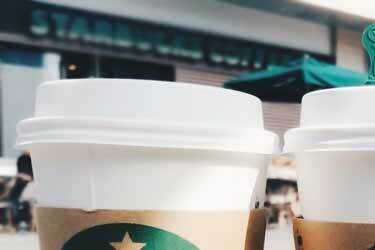 But if your doctor allows you to have moderate caffeine consumption, then the good news is that this is a zero sodium drink (at least that part is good for blood pressure). Even if you make it as a super-sized American version – with two or three servings – it remains a guilt-free indulgence. Of course, if you add milk or sugar, that can change things. Ingredients: Organic Vanilla Soymilk [Organic Soymilk (Filtered Water, Whole Organic Soybeans), Organic Evaporated Cane Juice, Calcium Carbonate, Natural Vanilla Flavor, Sea Salt, Carrageenan, Sodium Citrate, Baking Soda, Vitamin A Palmitate, Vitamin D2, Riboflavin (B2), Vitamin B12], Matcha Tea Blend [Sugar, Ground Japanese Green Tea]. Don’t be fooled by the “evaporated cane juice” verbiage. The FDA frowns upon that term. Back in 2016, they issued strong guidance about it and for good reason. Think about… all sugar which comes from the sugar cane plant was at one point a “juice” or liquid. It’s not like the plant is spewing out dry powder on its own! It always has to be dried or “evaporated” to make a dry sweetener. The phrase “evaporated cane juice” is just clever marketing, as the FDA reports dried cane syrup is 99.0 to 99.8% sucrose (3). Here’s how to make a latte which is actually good for you. 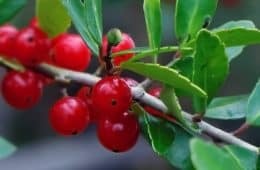 Since it’s not an original Japanese drink, it’s impossible for it to be authentic, though it is delicious and better for you than the crap Starbucks is selling. 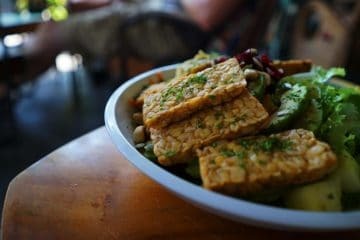 This vegan and gluten free recipe minimizes sugar and calories, while maximizing nutrition and antioxidants. Makes one 4 ounce serving. 17 calories, 1g of fat, and under 1g of sugar. Cholesterol free. 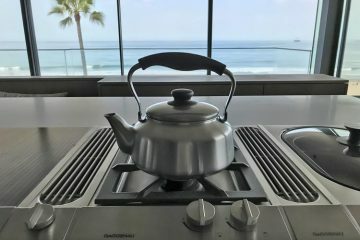 Combine milk and water in saucepan and place on stove. Apply low heat. When mixture shows first signs of simmering, remove from burner. While mixture is cooling, sift the powder into a bowl. Slowly pour liquid mixture onto the sifted powder in the bowl. Whisk vigorously for 30 to 60 seconds. Optional: If using a sweeten, add it before whisking. See our reviews of monk fruit sweeteners. Our favorite is a Japanese brand with zero calories and it’s diabetic friendly, since it has no impact on blood sugar. For an iced latte, prepare it using double the powder and sweetener. Follow steps 1 thru 5 and allow for it to cool for 5 minutes. Pour mixture over 1/2 cup of ice in a glass tumbler and enjoy. Makes one 8 ounce serving. Someone asked us how to make matcha from green tea bags. That would be impossible, even if you wanted to open those little bags and grind the loose leaves inside. Why? Because even though the powder comes from the same plant as regular green tea, it’s grown and harvested in a completely different manner. There is no substitute. The process involves shading the plants for around 3 weeks. 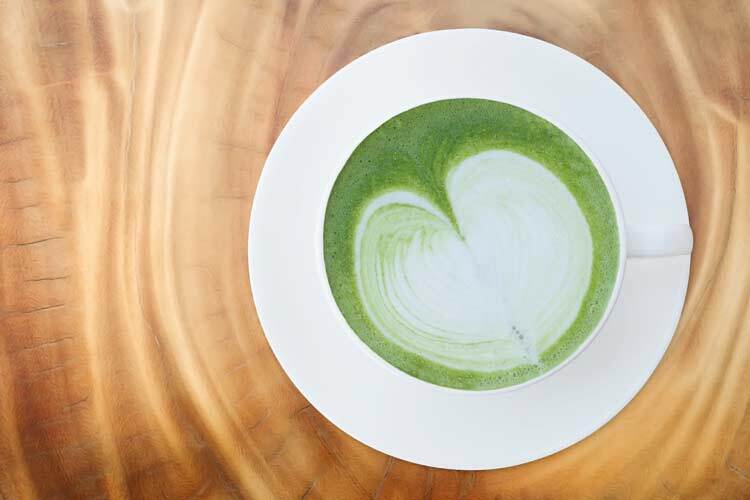 This is why matcha has a different profile of phytonutrients, flavor, and color (the shade spurs the plant to produce high amounts of green chlorophyll). 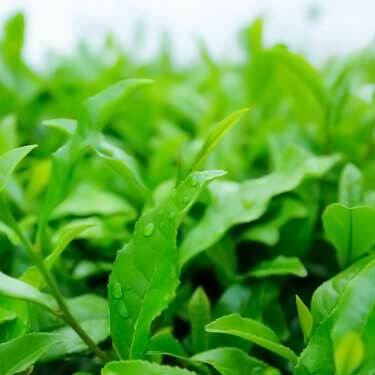 Unlike normal green tea which is simply ground up leaves and stems, with matcha it’s only the leaves. The highest quality grades involve meticulous removal of the leaves, before they’re ground to a fine powder. Cheaper grades are processed using large-scale, industrial farming methods. This can result in more of the pieces you don’t want – stems and duller leaves lower down on the plant. The leaves at the top are most vibrant because of higher chlorophyll. They’re saved for the higher grade teas. Made using the first harvest of the youngest leaves, with all stems and veins carefully removed. 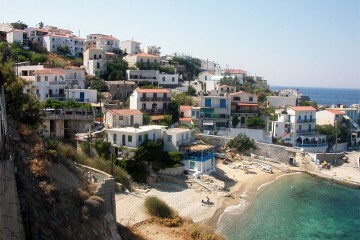 It is ground using stone. 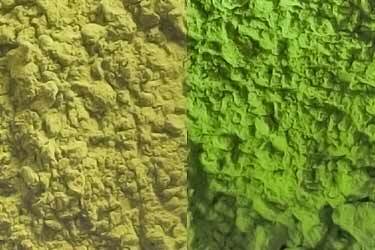 It will be the brightest, most vibrant green color among all the grades. 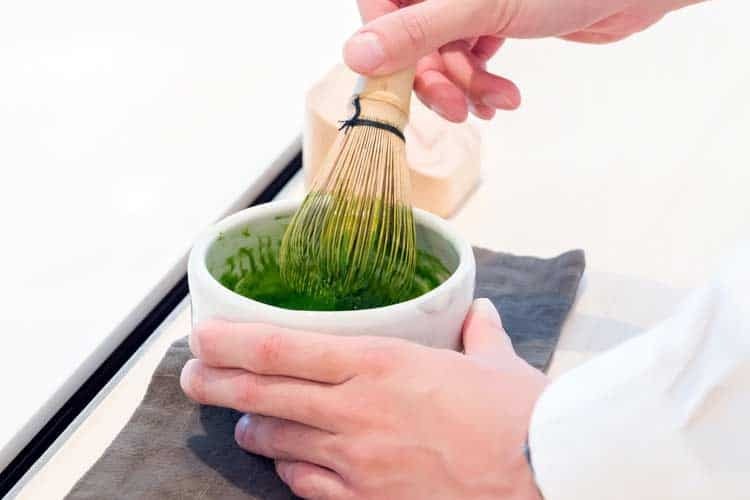 If you’ve had a bad experience and want to know how to make matcha tea taste good, try ceremony grade. This consists of the following 5 subcategories. While it may not be made using the first harvest or be stone ground, these early leaves are more economical for daily consumption. The color will be less vibrant versus ceremonial. 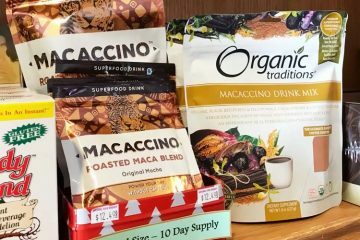 Given its concentrated potent flavor, this fine textured powder is perfect for mixing into a latte, smoothie, or cappuccino. It’s also a good choice for making desserts. Compared to ceremonial grade, the color difference of the lower quality culinary grades will be quite profound; a dull yellowish-brown. This is because the newest leaves are the greenest. The next step down, this is a combination of early and later harvested leaves. 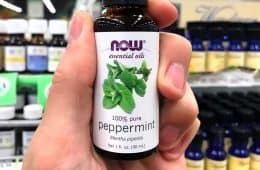 Since it can be quite bitter, this grade is often used in combination with dairy, almond milk, and other vegan alternatives. It works in non-gourmet baking recipes as well. 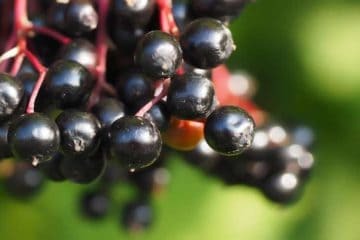 Gritty with a darker color, this is sold in bulk and more appropriate for use in food production, as it can have an astringent taste on its own since it contains the lowest amount of early leaves. This low grade matcha is the cheapest among them all and therefore, it’s mostly used for commercial purposes. Expect a much yellower color and a less appealing taste. 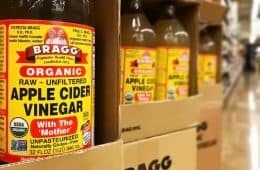 If you’re on a budget but still want the health benefits of the beverage, this still remains an option for brewing, but you may have to mix it with sweetener and coconut or almond milk so it doesn’t taste so bad. While they don’t disclose the exact grade, you can bet your matcha green tea powder from Starbucks is not ceremonial. The fact that they have to load it up with sugar should clue you in as to its quality and how it might taste naked. Even the fine coffee shops often will only use a café grade, at best. While it’s hard to find, everyone deserves to try ceremonial grade, otherwise they haven’t truly tasted what the definition of matcha is. Buy an organic ceremonial grade gift set on Amazon and you will have everything you need to brew your own bowl and experience it for the first time. It’s not just Starbucks, there are lot of well known matcha products online that are pretty low grade stuff, what’s worse is it’s from China, potentially tainted with lead etc. If you are going to drink matcha I would suggest only Japanese matcha.